Over the last two sections I covered rods, reels, lines and flies. Now I’ll wrap it up with accessories and casting. There are four items that I consider necessities and they are a hat, polarized glasses, sun screen and insect repellant. The hat provides protection from the sun and an errant fly and the glasses do the same as well as help in spotting fish. Sun screen is self-explanatory as well as the repellant. Today some consider a vest old school and instead have switched to chest or sling packs. In either case the purpose is to carry items like fly boxes, floatant, tippets, and possibly an extra reel. I still use a vest and actually have two, a summer weight and one for cooler weather. Regardless of the option one chooses, the biggest challenge is to decide what is necessary to take otherwise the vest or pack will become quite heavy and overloaded. Then the typical reaction is to get a vest or pack with more carrying capacity. Another item to consider is waders, although if you are fishing warmer waters they may not be necessary. Like my vest, I own two different pair. I use a pair of heavier neoprene waders for early spring, fall and winter wading and a pair of lightweight breathable waders for late spring, summer and early fall fishing. I prefer the stocking foot waders which require the purchase of wading boots. 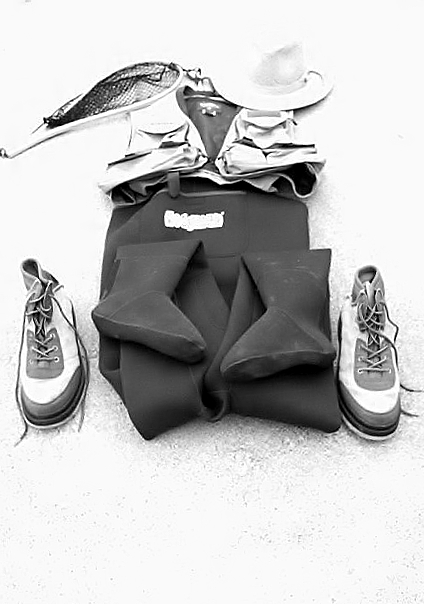 Waders with the boot attached can also be purchased and are usually less expensive overall. Again this is a preference item but I feel I get a better fit in my waders and my boots with this option. Therefore I feel more surefooted in wading. A key issue is what type of water you will be fishing. The bottom structure of the river will play a big role is selecting the type of sole on your boot. One thing about waders is that when you least expect it, they will leak. For years I fished without a net but one year my daughter gave me one as a present and I have used it ever since. There were a number of fish that could have been lost had I not had that net. The net also is good for the fish in that the angler does not need to battle the fish to the point of exhaustion before landing it and thereby preventing needless morality. When we think of fly fishing we imagine some person standing in a river and casting a fly in a graceful manner. In reality most of us have ended up wrapped in fly line and being embarrassed. Fly casting is different than spin or bait fishing where the weight of the lure is responsible for the taking out of line. Fly fishing uses the weight of the line to propel the fly. The real test is not how far can I cast a fly but can I accurately place it where I want it. In many sections of the country with overhanging limbs or brush, thirty feet may be a long cast. The best way to learn to cast a fly, outside of taking lessons, would be to observe a video and then go out into your backyard or some other open area and practice. I have found women to be easier to teach then men as they do not try to “muscle” it. Casting a fly is not about brute strength but is in the motion of the lower arm moving back and forth in a controlled manner. Outside of practice it is not necessary to perform the casting motion a half dozen times before the fly lands on the water. The fish are in the water not the air. This has been a very brief description about the sport and more detailed information can be obtained on the internet or at a book store. Don’t get bogged down in research but go to a local fly shop and talk to the people there. Be careful because once you try it your hooked! I'm an original fidget spinner! I enjoy being active, snowshoeing, skiing, fishing, hunting, hiking and the outdoors. I love to read and travel with my spouse. Life is short so don't waste it. This entry was posted in fishing, fly fishing, Uncategorized and tagged casting, chest packs, fishing, fly casting, fly fishing, hats, sunglasses, vests, waders. Bookmark the permalink.